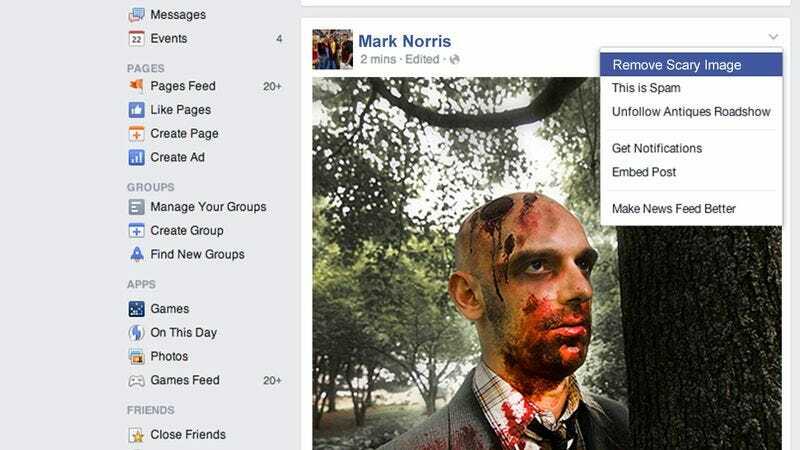 Should Facebook STOP Banning Scary Pictures? It might not have happened to you, but millions of Facebook users have had some of their pictures removed without their consent. The reason? According to Facebook, they’re too scary. Since the social networking site added the “report as scary” button for pictures, millions of photos have been taken down for violating its strict no-scary policy. Banned pictures have included images of shrieking banshees, old houses at twilight, graveyard mist, and other depictions of frightening or blood-curdling content. All this has us wondering: Should Facebook stop banning scary pictures? Facebook maintains that the no-scary policy is simply an effort to make sure the site is appropriate for all ages, but many users are saying a ban on images that chill you to the bone and make the hair on the back of your neck stand on end is a violation of their free speech. There are more glaring examples. Earlier this month, Facebook user Monica Dunlever uploaded a picture of her daughter dancing with a Victorian-era ghost that was quickly taken down, despite the fact that the picture is clearly just whimsically eerie and not scary at all. But Facebook doesn’t seem to care. Regardless of user complaints, it is still committed to upholding its prohibition of frightening content.